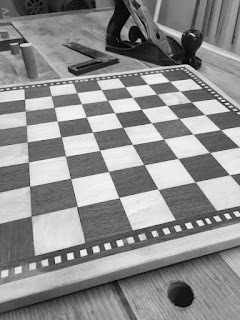 After my second chessboard, I realized I wanted to make something a little more ornate. So I decided to make another one (this one would be a gift for my sister), with a more decorative banding around the edge. I think it came out pretty well! I also made another box for the chess pieces too. I used some old, salvaged wide pine floorboards from 1860 that I cleaned up to use.